In this class we will be covering the most crucial points in detail on the first few stages of a plants life. 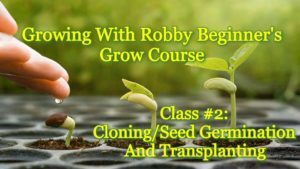 We will be discussing sprouting seedlings, taking cuttings, and transplanting rooted cuttings to larger containers without the plant going through transplant shock. A side effect of transplanting that can delay growth. This is the followup class to the Introductory Basic Concepts and Requirements class.